Pork sausage meat and tangy onion chutney, wrapped in light and buttery puff pastry. Fortified British Wheat Flour (Wheat Flour, Calcium Carbonate, Iron, Niacin, Thiamin), Pork (19%), Water, Concentrated Butter (Cows' Milk), Onion (8%), Salt, Onion Powder, Pasteurised Free Range Egg Yolk, White Pepper, Nutmeg, Sage, Butter (Cows' Milk), Yeast, Medium Fat Hard Cheese (Cows' Milk), Preservative: Sodium Metabisulphite (Sulphites); Caraway, Coriander, Cardamom, Cloves, Free Range Egg, Antioxidant: Ascorbic Acid; Rapeseed Oil, Cinnamon, Brown Sugar, Parsley, Balsamic Vinegar, Cider Vinegar, Black Pepper, Lemon Juice, Chilli. 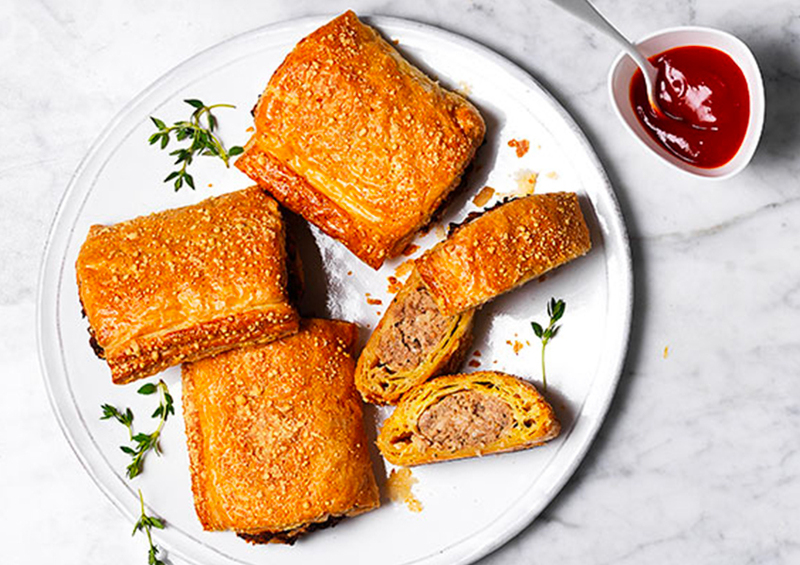 Crisp layers of buttery puff pastry filled with Taste the Difference sausagemeat, herbs and caramelised sweet onion chutney.